Osteoporosis is a type of bone disease in which the bones become thin and weak, and thus much more susceptible to fractures or breaking. This disease can happen to any person at any age, but it is especially common in older women. In fact, as many as 50% of women over 50 years old will break a bone because of osteoporosis. Fortunately, there are steps a woman can take to prevent and manage osteoporosis. To prevent and manage osteoporosis, it is essential that women eat a well-balanced diet full of dairy, protein, fruits, and vegetables in order to get the proper nutrients to support proper bone health. Experts recommend that women between 51 - 70 years old get 1,200 mg of calcium each day. The most obvious source of calcium comes from dairy products, such as low-fat milk, cheese, and yogurt. Leafy greens like broccoli, kale, and spinach are also excellent choices. Other products may have added calcium, such as tofu, orange juice, or breakfast cereal - simply check the label. The recommended amount of vitamin D for those under 70 years of age is 600 IU per day. Among its many roles, vitamin D helps the body absorb calmium. Many calcium-rich foods are also fortified with vitamin D, such as dairy products and orange juice. It is also found in some fish, like salmon and tuna. Supplements are always an option, or, simply getting 5 - 30 minutes of sun exposure twice a week directly to the skin can also provide the body with enough vitamin D.
While calcium and vitamin D are arguably the most crucial nutrients for bone health, more research is emerging that highlights the importance of protein. In youth, protein is vital for the growth of bone mass, and later in life, it is responsible for preserving it. Additionally, loss of muscle strength from insufficient protein can contribute to falls that result in fractures or breaks. 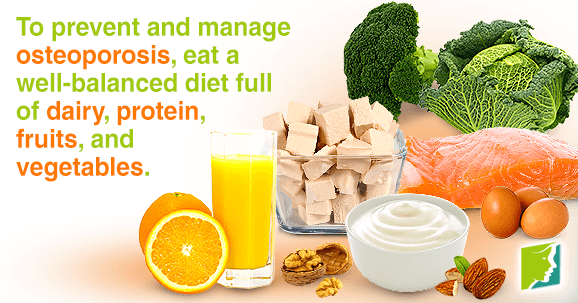 Choose foods such as lean meats, fish, eggs, legumes, soy products, and nuts. Experts now realize the importance of other nutrients such as magnesium, potassium, vitamin C, vitamin K, zinc, and several B vitamins when it comes to bone health. Further, studies show that a higher intake of fruits and vegetables in the elderly has a beneficial effect on bone density, thanks to their large array of vitamins and minerals. Regular exercise is essential for both preventing and treating osteoporosis. Not only does exercise prevent bone loss, but it also increases muscle strength, coordination, and balance, as well as improve overall health. Weight-bearing exercise is shown to be the most beneficial for the bones. Try activities like walking, lifting weights, hiking, climbing stairs, dancing, tennis, or yoga. Excessive alcohol consumption. Consumption of alcohol equal to or greater than two drinks per day can dull the effects of a healthy diet and may also increase the risk of falls and accidents. Smoking. Studies show that smoking greatly increases the risk of developing osteoporosis. A good way to prevent and treat osteoporosis is through a healthy lifestyle full of good habits, such as eating a well-balanced diet and getting regular exercise. Low estrogen levels during perimenopause can increase a woman's likelihood of developing osteoporosis. Find out more about this condition. Osteoporosis is a degenerative bone condition that affects most people to varying degrees as they age. Is HRT a viable treatment for osteoporosis?